Alex Txikon, Muhammad Ali Sadpara and team are now at Camp 2, 6500m/21,325′, targeting a weekend summit date. 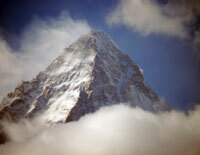 They took a rest day today 22 Feb and will move up the Lhotse Face to Camp 3 on the 23 where they will spend the night. Next is to the South Col to sleep for a few hours then go for the summit, hoping to top out around dawn on Sunday, 25 February. Of course this schedule can change due to weather, snow conditions, health, etc. High winds are expected back on the summit on Sunday night. It is clear that Alex will not be using supplemental oxygen, that is the point of this winter attempt. 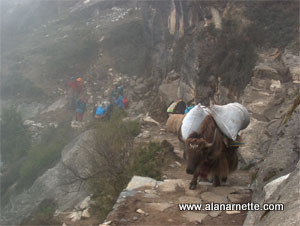 I understand the Sherpas will be on O’s to serve as a safety net. It’s unclear if Sadpara will use O’s. The original start of the winter season set forth by the Nepal Ministry of Tourism was December 1. Autumn-permitted teams were supposed to end their climbs by mid-November (there was a two-week gap where no climbing was permitted). Winter-permitted teams were not allowed to go above BC before December 1 (although they could arrive at BC before that date). We have continued to use December 1 as the start of winter season. Choosing between Dec 1 and Dec 21 is really quite arbitrary. Winter has been established a long time ago and depends on the inclination of the earth’s axis. If change the axis, it will change the date of winter. Currently, winter is usually from December 21 to March 20. And during this period all mountain activities should take place above BC! Since the creators of winter himalaism say so it should be. Because somehow nobody wanted to climb 7,000 and 8,000 in winter. But now everyone wants to set rules for Poles. Strongly pathetic. Forecasts by atmospheric models are inherently gridded. We are not and never will able to run a perfectly resolved model due to our limited computing resources. We have to rely on calculating atmospheric variables (pressure, wind, temperature, moisture) for a limited number of points on a grid. Arguably, the best global forcast system today is run by the European Centre (ECMWF) at a resolution of ~9 km. Even for a large mountain like Everest that is still quite coarse. That also means that the summit(-ridge) of Everest is probably not directly represented by a model grid point, but the atmospheric variables have to be interpolated using adjacent grid points. Even if one grid point would be sitting right on top the summit of Everest, it wouldn’t be at the correct height due to the underlying smoothed topography of the 9km grid, i.e. Everest in the model looks and behaves quite differently. Interpolating atmospheric variables inside the free troposphere is a tedious undertaking, as Alan found out on the Lohtse face. Thank you Klaus for your insight and comment. It’s not winter if it’s before the Winter Solstice. That would like saying you summited, when you just got close to the summit. “I could see the summit” – yea, sure, here’s your trophy.